Update July 31: Break out the bubbly. BBM beta is finally publicly available to all Windows Phone users. 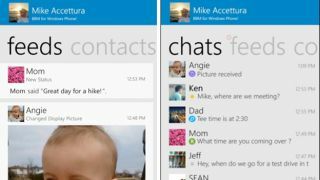 You'll need Windows Phone 8 or Windows Phone 8.1 to start thumbing out messages. Features familiar to the BBM set are there, though the company is really focusing on three key ones to start - Contacts, Chats and Feeds. The app aims to fit in with the Windows Phone look, meaning it emulates Microsoft's Metro motif. Users can also pin Groups and 1:1 chats on the Start screen for easy access. This is only BBM version one, and BlackBerry says it's already hard at work on version two, when it will bring more features to the fore. The app is free and available now (again, as a beta) in the Windows Phone Store. Android and iOS won't be alone at the BlackBerry Messenger party anymore come July, when BBM will launch for Windows Phone devices. After BlackBerry launched BBM for iOS and Android in 2013 it was only a matter of time before the messaging service arrived on WP as well, and the company confirmed in February that it would arrive this year. Now BlackBerry CEO John Chen has informed the public that BBM for Windows Phone will in fact arrive in July. Chen dropped the news on an earnings call Thursday morning, CrackBerry reports. Windows Phone will be the fourth platform to host BBM, after BlackBerry 10, iOS and Android. The most recent advancement on the iOS and Android side was the addition of free calling among BBM users. However, it's unclear at this point what features will be available in the WP version when it arrives next month. We've asked BlackBerry for some more details about BBM for Windows Phone, and we'll update here if we receive any.